In my first post about Monroe Canyon in the Pine Ridge of northwestern Nebraska, I featured the sumptuous Cicindela lengi (blowout tiger beetle) – a target species for the trip and one of six tiger beetle species that Chris Brown and I would find at this quarter-mile long sandy roadside embankment. Another species we found there was C. denverensis (green claybank tiger beetle), unexpected given its preference for clay soils, but like C. lengi also a target species and thus a welcome find. We also saw some more common species – the nominotypical forms of C. formosa (big sand tiger beetle) and C. scutellaris (festive tiger beetle), both reliable residents of sand habitats throughout the Great Plains, as well as a few individuals of the often ubiquitous C. punctulata (punctured tiger beetle). 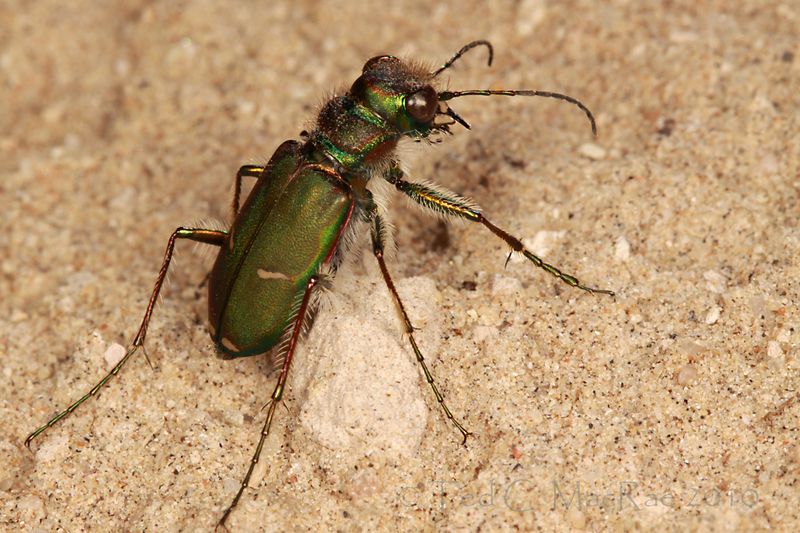 The most numerous of all, however, was C. purpurea audubonii (Audubon’s tiger beetle). Despite being uncommon in other parts of its range (in fact, nominotypical populations are feared extirpated in some parts of the eastern U.S.), C. purpurea audubonii is one of the most commonly encountered tiger beetles in grassland habitats throughout the central Great Plains and Rocky Mountains. This species belongs to a complex of several that are generally green in color and fond of clay soil habitats, such as C. denverensis, C. decemnotata (badlands tiger beetle), C. limbalis (common claybank tiger beetle), and C. splendida (splendid tiger beetle). All of these species can co-occur with C. purpurea audubonii in the Great Plains, but the latter is distinguished by its faint purple tinge and distinct metallic purple border around the edge of the elytra and its reduced elytral markings consisting of a short, oblique middle line and a white rear tip at the edge of the elytra (Pearson et al. 2006). All of these characters can be seen easily in classic pose in the above photograph. Despite its commonness, however, I actually did look forward to seeing this species – the reason being the occurrence of occasional all-black individuals in the population. Tiger beetles as a whole are a variable lot – polytopism (geographically based variability) is the rule! Despite this, for the most part individuals within a given population usually exhibit a fairly uniform appearance. Occasionally, populations of some species – generally those at intergrade zones where different subspecies meet – will show variation on a continuum between two extremes. The occurrence of two distinct morphs within a population, however, is rather unusual. I lacked good field photographs of the all-black morph of C. purpurea audubonii (and also the green morph, for that matter), so I was pleased to encounter several individuals of the black morph while we were at Monroe Canyon. As can be seen in the above photograph, black morph individuals are truly all-black, perhaps with a purple reflection but without a trace of green anywhere on the body. They do retain the same pattern of reduced white markings exhibited by the green morphs. 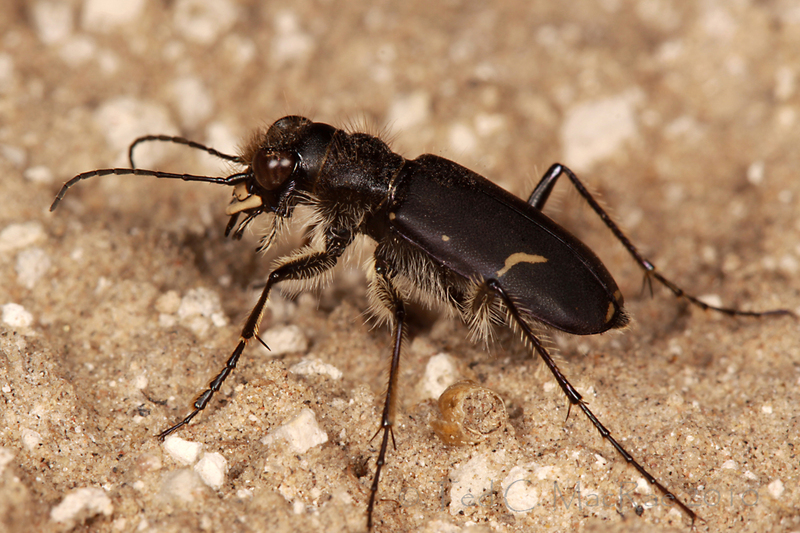 As a result, these individuals can be confused with some other black species that also occur in the Great Plains, such as C. nebraskana (prairie long-lipped tiger beetle) and, at higher elevations, C. longilabris (boreal long-lipped tiger beetle). These latter species were also targets for our trip, so we had to pay close attention to any black morphs that we saw to confirm their identity (C. purpurea audubonii black morphs are distinguished by their distinctly hairy frons). 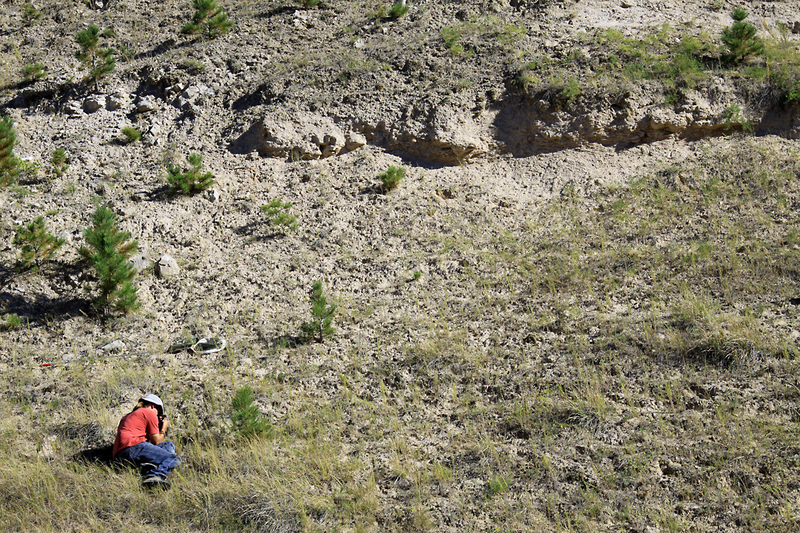 Chris Brown waits patiently to photograph a burrowing wolf spider at the entrance of its burrow. I’ve not been able to find any additional information about these black morph individuals and the possible causes for their occurrence. Cicindela purpurea is a so-called “spring-fall” species, emerging in the fall as sexually immature adults and then spending the winter in burrows before re-emerging in the spring to mate and lay eggs. As spring-fall species go, it is one of the earliest to appear in the spring and last to disappear in the fall.¹ This immediately brings to my mind a possible thermoregulatory function. Low temperatures may be a challenge for the adults during early spring and late fall, and the black coloration could be an adaptation to maximize absorption of solar radiation for heat gain. This idea seems to be supported by the fact that the incidence of black morphs is greater at more northern latitudes and in the higher elevations of the western part of the subspecies’ range (as much as 20-40%), where overall lower temperatures would be expected to occur. ¹ Karl Werner even amusingly stated that this species “rather delights in chilly weather” (Acorn 2001). This entry was posted in Cicindelidae, Coleoptera and tagged beetles, entomology, insects, nature, Nebraska, science, thermoregulation, tiger beetles. Bookmark the permalink. Thanks again for the detailed information which novices like myself rarely find. Glad you appreciate it, dang! Am always trying to learn something new everyday, this is a good place to start. Thank you. You’re welcome – and thank you for reading! You’re really making me start to like tiger beetles. Where can I learn what species to keep an eye out for here in AZ? He he – they are infectious! A good website for you to start with is Tiger Beetles of the United States. You can click on Arizona and see a list of species with hyperlinks to photos of pinned specimens. The “Distribution Maps” link lets you drill down to further to see which species have been recorded from an individual county. A more technical resource is Tiger Beetles of the Genus Cicindela in Arizona (Coleoptera: Cicindelidae), a 1979 M.S. Thesis by Judy Bertholf. The taxonomy is a bit dated in some places, but it has much more detail (if you’re interested). If you find that you really dig tiger beetles, the field guide by Pearson et al. (2006) is a must have! (reference citation in post). Thanks Ted. The occurrence of two different color morphs of the same species in the same area is interesting. Your article reminds me that I still have to sort out some of my tiger beetle shots that I have taken up here in Alberta. I’d like to see what you’ve found up there. You DO have Acorn’s book, don’t you? 🙂 You bet! Essential book for Alberta Bugsters! And if I have any problems with I.D., John will usually jump in at the AlbertaBugs forum to help straighten things out. I wonder what the correlation is between the immature Fall adults and colder tempertures. Thermoregulation, as you mnetioned? Conservation of metabolic resources during the winter months? Thanks, Delbert. That’s a good question – I wonder how the whole spring-fall life history strategy arose to begin with. It seems to be a feature of the true Cicindela (formerly s. str. ), which I seem to recall from a recent molecular study are actually one of the more derived groups within the family/subfamily/supertribe… They also seem to be the most boreal of groups – perhaps summer life histories were the norm and the spring-fall strategy developed as Cicindela (s. str.) began radiating into more northern climes. I think what I was wondering, and forgive me if I am repeating myself, if sexual maturation is metabolically exigent for an organism that will spend the winter in a quasi-diapause, especially since potential prey and other metabolic resources would be limited? Yes, I agree with this – it seems larvae hatching during the fall would have difficulty gaining enough nutrition to survive a long winter, so it doesn’t make much sense to lay eggs at that time to begin with. If egg laying will not be done until spring, no sense in going through the metabolic cost to mate and develop eggs (or at least store sperm). I wonder if the adaptation originally arose as a shift from summer emergence to spring emergence, and a later adaptation was for adults to emerge ahead of time during fall to augment nutrient reserves and improve survival during winter prior to emergence. The fact that not all spring-fall adults emerge during the fall (the rest just stay in the ground and emerge the following spring) seems to support this. That is exceptionally cool. It’s fascinating that two color morphs reside in the same place. One normally thinks of the morphs as being strategic to location or specific to disparate populations. I’m always fascinated to see instances where the variations coexist without drowning each other out of the evolutionary pool. The only other (not quite as extreme) example that immediately comes to my mind is Habroscelimorpha circumpicta (cream-edged tiger beetle) that occurs in saline habitats throughout the central and southern Great Plains – they are largely white, but the medial portions of the elytra are either red, copper, or blue/green with little/no blending of the colors. I suspect the reasons for different color morphs in that species are quite different from Cicindela purpurea. Heh, ted….. another example of extreme color morph is C. scutellaris rugifrons in the NJ Pine Barrens. (Green and Black). Also, the nominate ssp. of Purpurea is not commonly found in the Mid atlantic states. Great info! Hi Richard – I didn’t know that about rugifrons (which I haven’t yet had a chance to look for). The Pine Barrens seem quite an interesting place from what I’ve read so far – maybe worth a trip sometime! as far west in purpurea to at least one location in far eastern Plumas County in northeastern California. This is an area of sagebrush and pine mix about 12 miles west of the Nevada border, near Chilcoot, CA. This would be considered an intergrade area with the subsp. C. p. hatchi. Thanks, Charlie. I’ve been wanting a good photo of the black morph for some time now. They weren’t very common in the part of Nebraska where I was either – about 1 in 25 as well. I think up in Alberta they are more common. Strange how the black morph only shows up in subspecies audubonii and intergrades with it.